For highest gas pressure stability. Dome-loaded pressure regulators are operated with gas pressure. Unlike spring-loaded pressure controllers, the opening force of the valve required for pressure reduction is generated by the pressure of a so-called pilot gas and not by a spring. 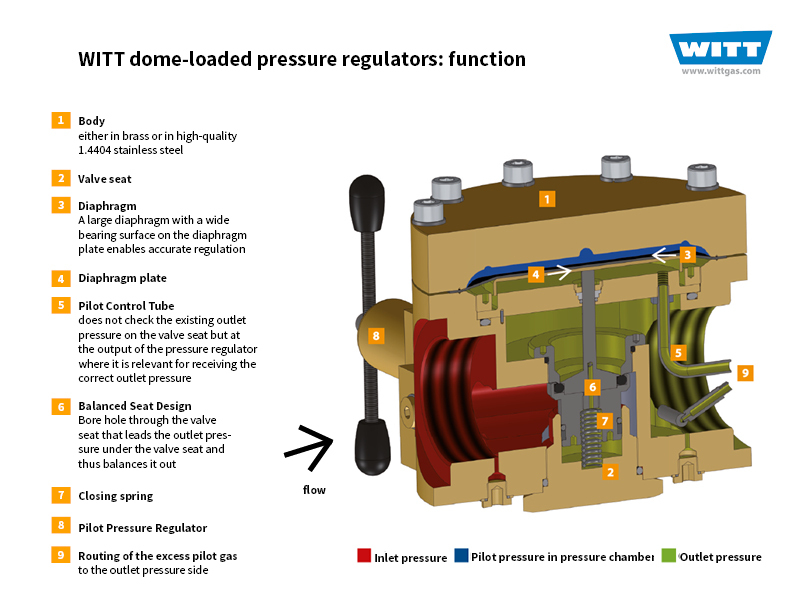 In the dome-loaded pressure regulator sets from WITT, the gas to be regulated is itself used as the pilot gas („own-medium controlled“). The gas to be regulated is supplied to the dome where it reaches the valve seat. The pilot gas is controlled via a built-in pilot gas regulator and led into the pressure chamber. Here, it acts on a diaphragm whose stroke movement is transferred to the valve seat via a diaphragm plate. So the valve gets opened or closed via the pressure of the pilot gas and the relevant stroke movement of the diaphragm, dependent upon the chosen operating pressure, and the flow required. The excess pilot gas is routed to the outlet pressure side via an integrated non-return valve. 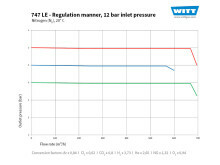 Thus, WITT dome pressure regulator sets are closed systems and allow the outlet pressure to be adjusted whilst in service. 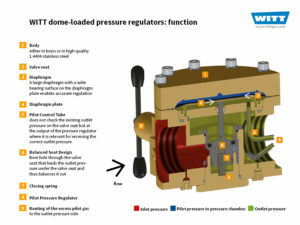 WITT dome-loaded pressure regulators are flexible as regards the gas supply. 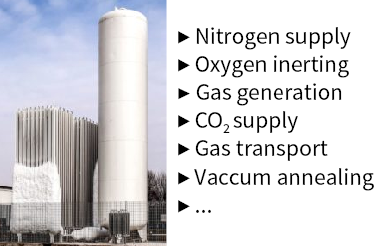 The regulated gas (internal medium) is used as pilot gas. Therefore, the dome-loaded pressure regulator works autonomously and the pilot gas is then supplied to the outlet pressure side once again. 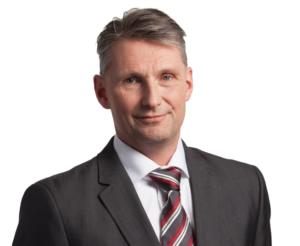 Gas is thus not used for pressure control and there are no additional costs. A major advantage of the WITT dome-loaded pressure regulators is their easy and flexible use. The integrated pilot pressure regulator or an electric proportional valve can be used to adjust the operating pressure as soon as a different gas pressure is required at the outlet point or the gas or ambient temperature changes significantly. 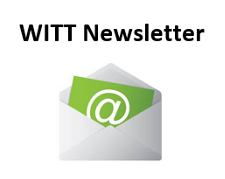 Unlike many other designs, the diaphragm of WITT products is not located directly on the valve seat. Instead, it transfers the stroke movement via a special diaphragm plate. This allows extremely fast adaptation to withdrawal changes. There are no fluctuations in the outlet pressure till the pressure controller finds the correct valve opening. The special diaphragm also enables an extremely wide regulation range. The pressure is accurately regulated even in case of small pressure differences of less than 1 bar in the inlet pressure and the outlet pressure. Large pressure differences can also be realised. A 2-stage pressure reduction is therefore not required. Do you have questions regarding dome-loaded pressure regulators or do you require a quotation? Talk to us about your requirements or use our request form.